Thirsty Pilgrim: Geuze, Geuze, and Non-Smoking News. It only happens every other year. But that's twice as often as the World Cup or the Olympics, so let's count our blessings. The Toer de Geuze--Pajottenland's original lambic festival on wheels--is set for Sunday, May 1. 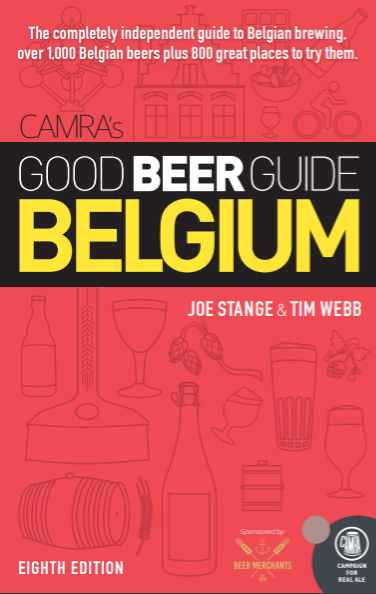 If you don't know: Nine lambic makers--Boon, De Cam, De Troch, Drie Fonteinen, Hanssens, Lindemans, Mort Subite, Oud Beersel and Timmermans--open their doors. They offer tours, beer and nibbles while buses carry happy people from one brewery or blendery to another. Each bus takes a different route, so choose carefully. For lambic enthusiasts, an ideal route mixes a couple of old favorites with those you'd like to know better. For everyone else, it really doesn't matter. A bus will carry you around the countryside to visit five places offering the most unusual beers on Earth. What else do you need to know? 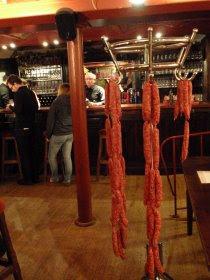 And if you go, like I did two years ago, you might just be lucky enough to see sausages on a coat rack. Or Armand Debelder in a bow tie. Speaking of Mr. Debelder, I have a bit more info about that limited series of Drie Fonteinen blends, set to launch in May. Indeed the blends are comprised entirely of different lambics brewed at Drie Fonteinen before the thermostat disaster and the decision to stop brewing. Again, the goal of these special blends is to raise extra money to re-start brewing there. So it all fits. Finally: Good news for Belgians and foreigners who like to smell and taste their beverages. Starting July 1 all Belgian bars and cafés must be non-smoking, says the constitutional court. Since the start of 2010 the ban had been limited to cafés that serve food, but even then "food" was loosely defined since pre-packaged foods like nuts and chips were allowed. Now the only exception appears to be for separate smoking rooms with special ventilators... Is it hard to imagine one-room bars installing these vents? Or maybe Delirium will install these vents in all its rooms. Oh, hell. Another loophole through which we could drive a waffle truck. interesting post mate! I've had plenty of online banter with people against the smoking ban in the Uk, but for me it was the best thing to happen to pubs in ages! I think like you say, people who actually go to bars for their beers and or food, and the flavour of said things, would genuinely prefer to not be surrounded by smoke. why take a bus when you can go by bicycle? I made a Google map with the participating breweries (http://goo.gl/ToYNj) to plan my route, probably working my way northward from Lembeek. Well done, Greg. Best of luck. I'm not sure I could be trusted with a bicycle after a few breweries, but then not everyone treats a festival Sunday with the same sense of purpose. Certainly a bike would offer even better views than the bus windows.